I’ve been optimizing my websites before conversion optimization was a thing. Every time that I get aggressive about optimization, I discover surprising things. For example, I form a hypothesis that the short landing page (control) will have higher conversion rates than the longform (variable). However, after we run tests, my hypothesis is completely overturned. The purpose of this article is to seed some thoughts and produce growth for those who want to take their CRO to the next level. Let me know if you test or change any of these, and what the impact is! 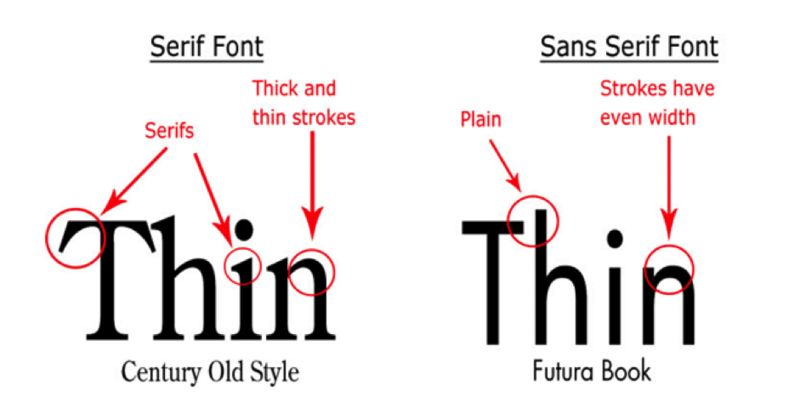 Fonts are a big deal in conversion optimization. When you think about it, you can understand why. Everything we read has a font. Being able to read something is only one part of the equation. The way in which we read it is what impacts conversion rates. 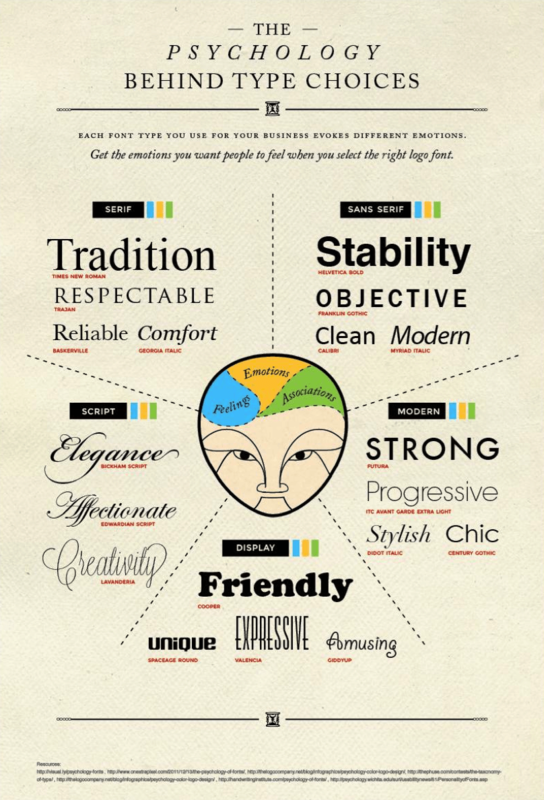 Each font style communicates something — clean, modern, reliable, comfortable, reputable, stable, trustworthy, fun, etc. Those feelings impact how much or how often people convert. Can you see how each of the different fonts projects a different feeling? The two main types of font are serif and sans serif. Sans serif fonts like Helvetica and Arial have a clean and modern look. Serif fonts like Georgia and Times are typical in books and print mediums because the additional strokes on the characters aid in readability. 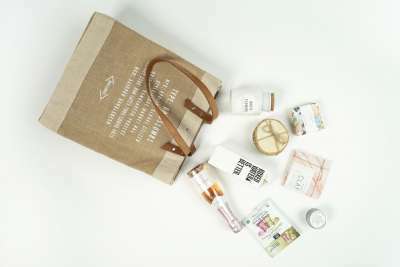 Sans serif fonts are generally used in headings because the lack of serifs forces the reader’s eye to move sequentially from letter to letter, rather than in a smooth sweeping motion. This slight delay causes the user to pay more attention to the headline. These two main types are only the beginning. There are millions of different fonts. Each font has a slightly different impact on comprehension and focus. There is no one right answer. It depends on your site, your audience, and many other factors. Serif fonts can help to improve trustworthiness. Comic sans and Papyrus are never a good idea (source). People read 12 point font fastest (source). People read Times and Arial fonts fastest. Keep in mind that many people are accessing your content on mobile devices. Font display on mobile devices is just as important as desktop display. The limited screen real estate means less flexibility when it comes to using unusual fonts. Chances are, kerning seldom crosses your mind, if ever. That’s okay, because it’s invisible. Kerning is the space between letters. I’ve dealt with the importance of kerning in a previous Crazy Egg post. The point I want to make here is that kerning affects readability, which affects conversions. What kerning adjustments should you test on your page to improve conversions? Along with regular headline testing, I suggest manually adjusting the kerning of your headlines. Try a wide kerning vs. a tight kerning and see if it changes anything. Test kerning variations on button copy. 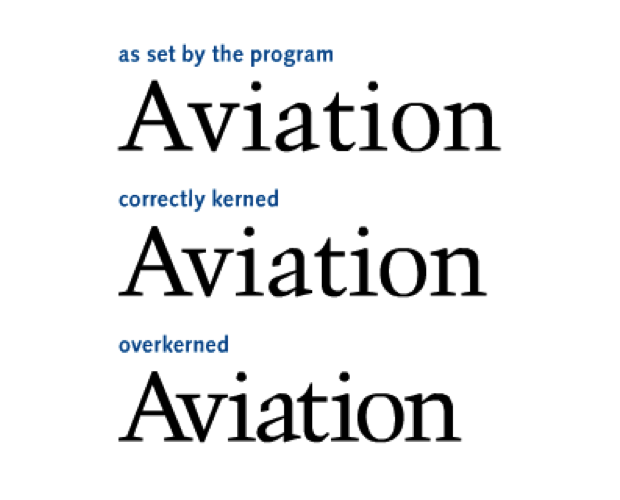 Like fonts, kerning is a common issue, and it impacts every interaction we have with written content across the web. 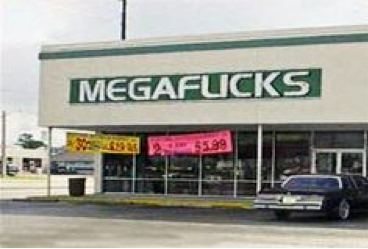 Make your kerning count. Gone are the days of standard screen sizes. Today, there are myriad display sizes, resolutions, pixel densities, widths, heights, formats, and shapes. Screen size and resolution matter for conversion optimization. Basic — Make your site fully responsive. Medium — Choose standard, web safe colors for displays. Advanced — Conduct email analytics and segment lists, and optimize email messages for various screen sizes. It’s not difficult to get data that will allow you to act on screen resolution optimization. 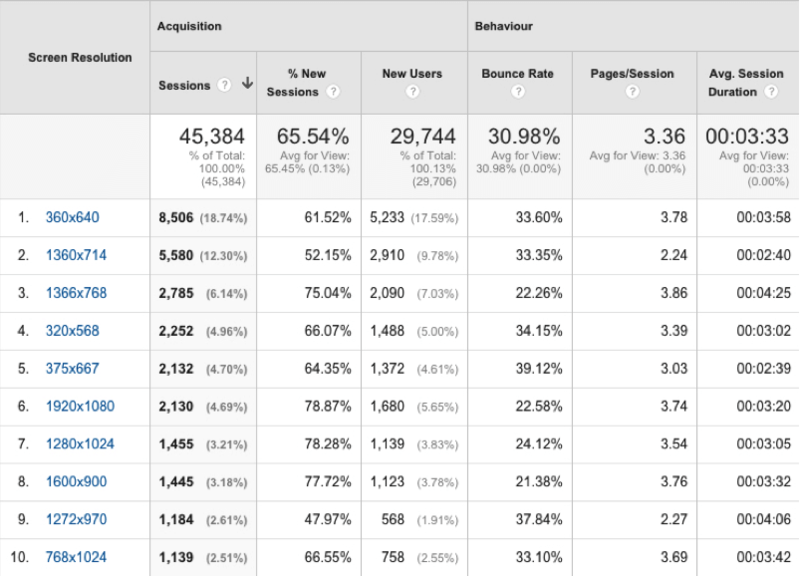 A quick glance at Google Analytics (Audience → Technology → Browser & OS) gives you an instant glimpse into your audience’s resolution metrics. First, you should know about the impact of screen resolution on optimization. Second, you should optimize for the most common screen resolution among your target audience. From the data above, you would instantly know that the majority of your users view your site on mobile devices — 360 x 640. 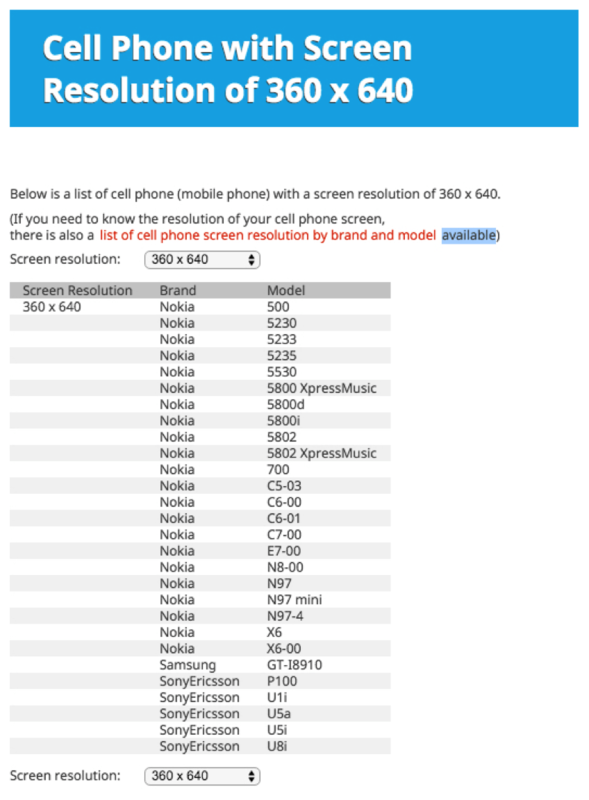 A simple Google search reveals that Nokia, Samsung, and Sony all produce smartphones with this resolution. Using built-in browser tools, you can view your website in the selected screen resolution to see how it renders, loads, and appears. 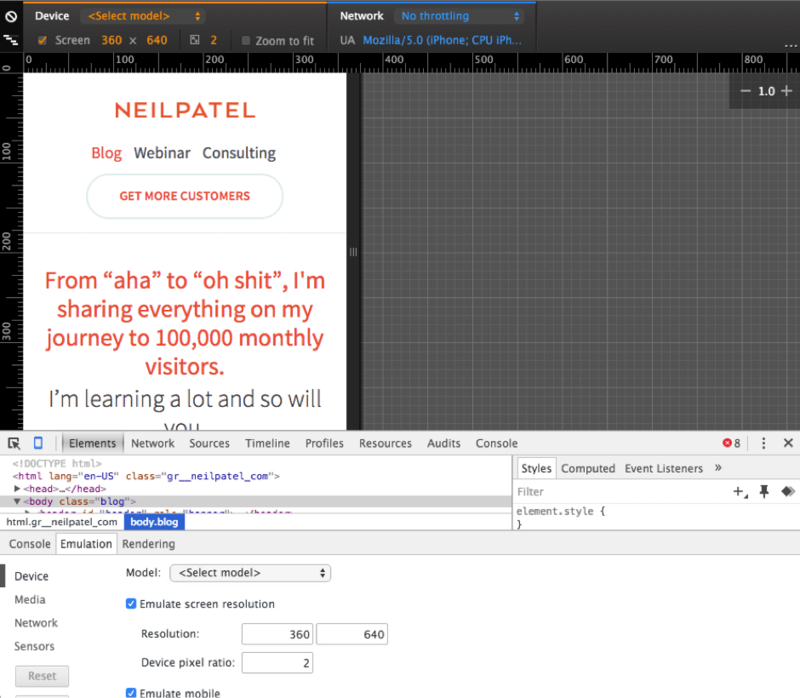 Using Chrome, I viewed a page from my website, NeilPatel.com, to assess its display. This level of investigation is essential to the process of optimizing your site for various users. Beyond mobile conversion optimization, you should aim for total screen resolution optimization. The way that users interact with your website holistically is an essential part of your overall conversion optimization. Plenty of websites use pictures of people. Few websites, however, test the impact of where those people are looking. When we view pictures of people, we tend to look at the eyes. Once we see the eyes, we tend to follow the direction of their gaze. Let me show you. In the image below, the woman is looking directly at the viewer. 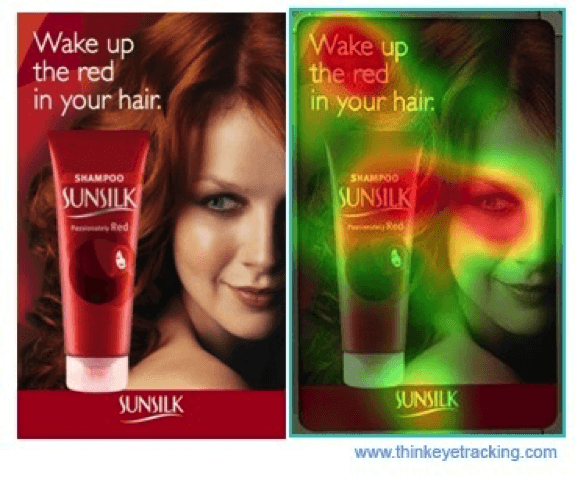 The eye tracking heat map shows that users will look at the headline, and then the region around her eye. Now, look at this photo. It’s exactly the same, except for the woman’s eye position. She is now looking to right. The eye tracking heat map indicates how much of a difference this makes. 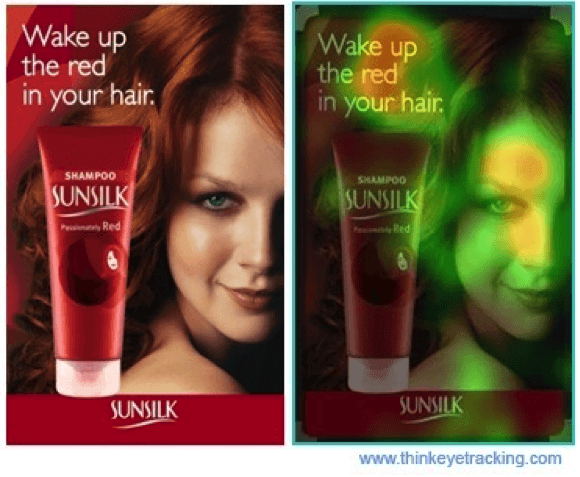 Users are more likely to look directly at the woman’s eye, and then to the product on the left side. 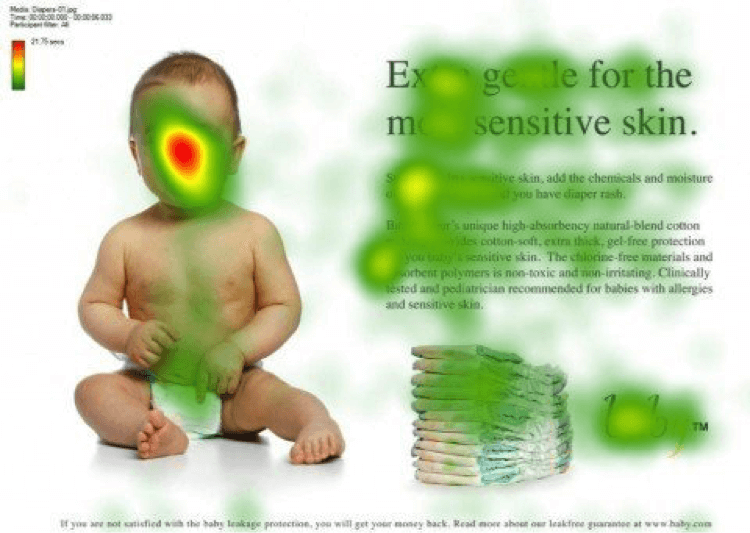 Testing gaze direction variables could powerfully impact your conversion rates. In most photos, people look directly at the camera. We’re used to this. For that reason, when a subject looks in a different direction, it’s more likely to capture our attention. I chose to use this ad image on Quicksprout.com because Ben’s gaze is directed at the ad copy. I want people to read that ad copy. This ad really works, and a big reason for that is because of Ben’s gaze direction. 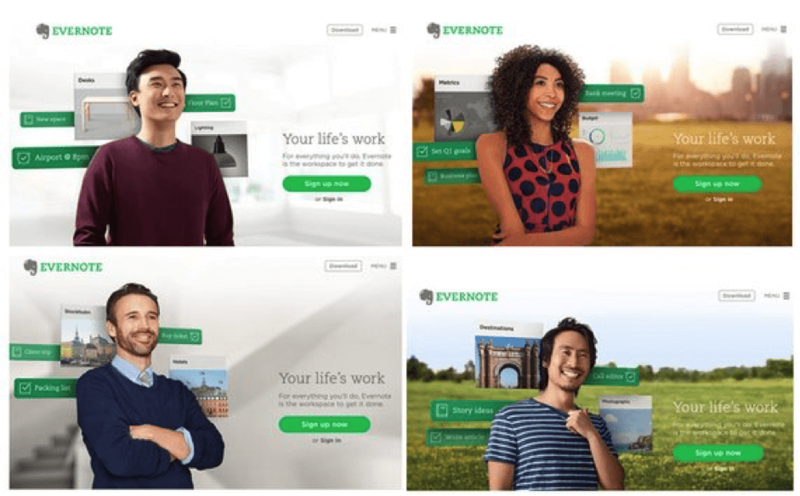 Notice the four examples of Evernote’s home page below. All the subjects are looking off in the distance. However, their gaze is directed towards the CTA button. This influences how viewers interact with the page. Two variations of a landing page below provide another example of how gaze direction impacts user behavior and, by extension, conversion rates. It’s a fine landing page and a great picture, but could it be better? Yes, it could. 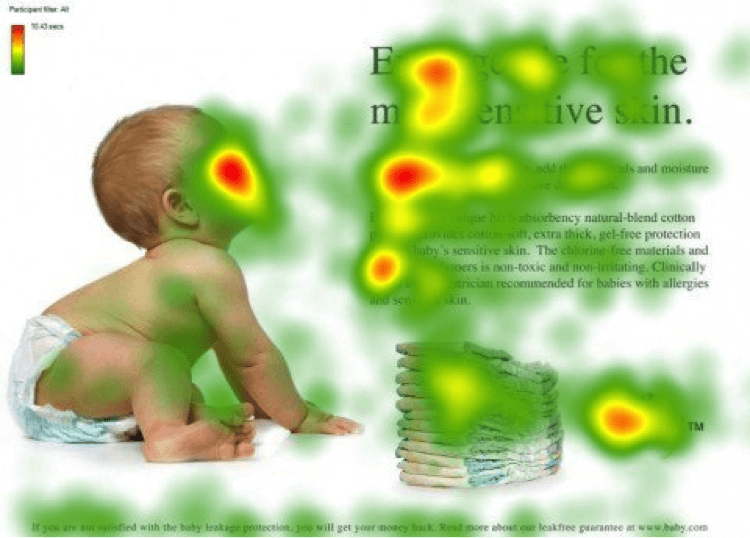 When the baby’s gaze is turned towards the headline and copy, people spend more time looking at the important elements. Images are not supposed to steal the show. Instead, they should enhance the most important element on the page — the copy and the CTA. 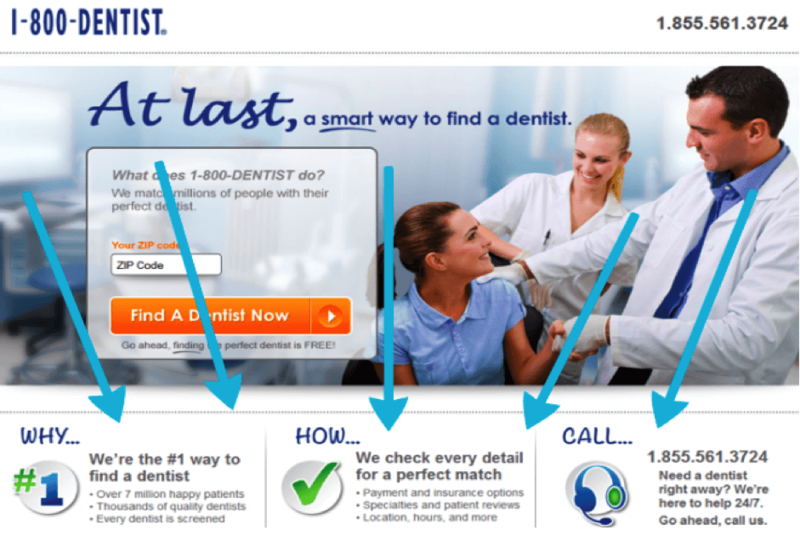 This landing page for a dentist finder shows three people. The people are looking at one another, which causes viewers to look from person to person. This distracts us from looking at the CTA, the benefits, or the phone number. It would be more strategic to picture people looking toward the important elements on the page. It’s an obvious fact among conversion optimizers: Color matters. 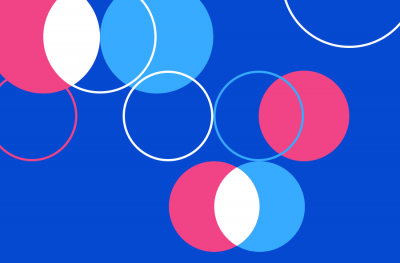 Background color is one aspect of color psychology that we tend to overlook. The background color of a website sets the mood for that site. Mood, in turn, affects user behavior, which affects conversions. Many times, conversion optimizers focus on button color, headline color, or font color. What they tend to overlook is background color. Most web designers recommend against using dark or black backgrounds. In the case of Ferrari, however, the dark background is a strategic choice. Why? Black evokes a sense of luxury, which is the connotation that Ferrari wants to cultivate in viewers. Nike, on the other hand, uses a white background with plenty of negative space. Why? This background color scheme evokes a sensation of freedom and motion, two aspects of brand imaging that are crucial to Nike’s success. This is just the start. There are plenty of under-the-hood aspects of your website that influence conversion rates. I suggest also testing benefit-focused CTAs vs. standard CTAs, social sharing metrics vs. no metrics, and line width for web copy. 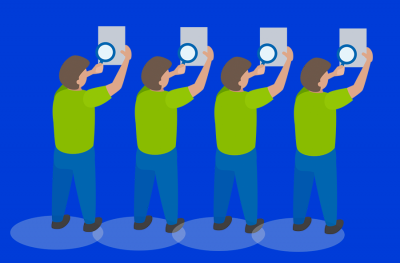 Each of these seemingly small things can produce significant changes in your conversion rates. Assume nothing. Test everything. Optimize constantly. What kind of split tests have you conducted that produced surprising results?